A different health-related theme is chosen each year, and this year’s is: Universal health coverage for everyone, everywhere. It is a slogan Hotels VIVA feels fully identified with and committed to. We believe in a concept of health that is completely integrated, interrelated with leisure, wellbeing, diet and healthy activities. The most important thing is that at Hotels VIVA we make the step from words to deeds, organising activities focusing on the main foundations underpinning people’s health: food, physical activities tailored to the requirements of each individual, fostering wellbeing and the fight against stress. VIVA Fit programme. 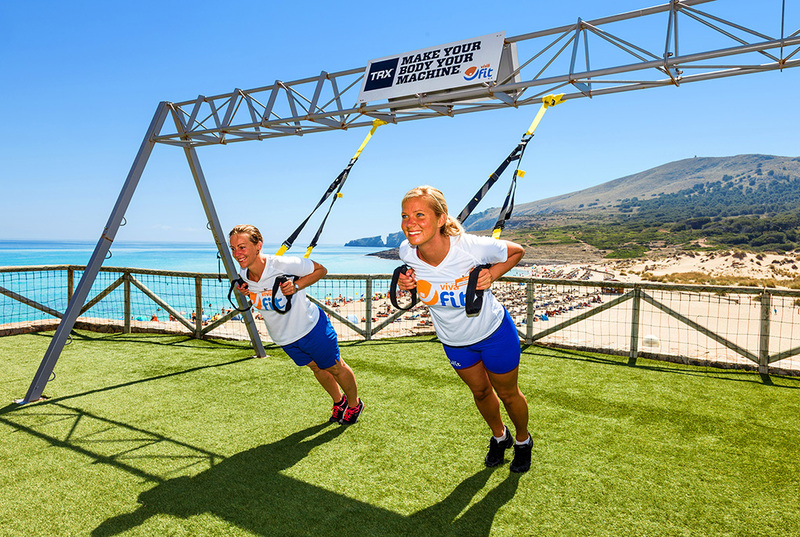 Organised by our entertainments team, all our hotels offer (six days a week and with a very extensive timetable – from 10:00 to 13:00 and 15:00 to 18:00) specialist sports instructors who will help you take part in all manner of activities at our fully-equipped gyms and facilities. Specialist-led classes and individual assessments will be available. From the end of April to the end of October we offer Pilates, Stretch & Relax, Fitbike, TRX, yoga and VIVA Dance classes, so you can learn to move your body to the rhythm of Zumba or Latin beats, not forgetting the summer’s star activity: Agua Fit. Plus many more choices and surprises. This season we’re outdoing ourselves and at Vanity Golf, VIVA Cala Mesquida Resort and Predi Son Jaumell we’ve arranged for an external yoga teacher to come three times a week, so you can reach your maximum level of mental and physical wellbeing! For sports professionals and serious devotees of sport, at VIVA Blue we have a SPORT Manager who will prepare and advise you so you can effectively combine your sports activities with a specific diet, overseen by our nutritionists. This will help you achieve your personal goals and get the greatest potential out of your sporting performance. Together with sport, the other main factor in achieving and maintaining a good state of health is food. This is something all the experts agree on. We take food very seriously and our buffets are renowned for the quality of the produce, their nutritional value and variety. Everything is planned out to enable you to follow a balanced and healthy diet. But we also provide an element of added value that sets us apart: specialisation. Our restaurants and buffets offer special menus for elite-level athletes as well as vegetarian, vegan, gluten-free and special-requirement diets in order to adapt to the tastes and needs of each customer. Each of us is unique and our diets are too, which is why we adapt ourselves to each individual, to what each customer wants and needs. We offer something of everything but, since we’re reluctant to rest on our laurels, we’re always happy to accept suggestions. We adapt ourselves to you and not the other way around. Happy World Health Day!